9th November is the birthday of Firefox, the browser that has always made browsing experience a great fun for all users. This November Firefox turned 8. All over the world, all Mozilla supporters and Firefox fans did celebrate this day in their own unique ways. I was a part of the celebration in Kolkata, India. A few ReMos and Mozilla volunteers had gathered in the evening in a place called Hiland Park, in South Kolkata. 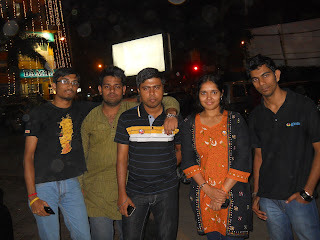 A very informal meet up....lots of chit chats, some sharing of thoughts. We couldn't get the cake, but the gathering can be called a success. Meeting people is always fun. Communicating via mails or on Facebook can never bring the same outcome as meeting people face to face and it indeed was so today. Before departing, we indeed did plan a meeting again in two days... that's the level of energy Mozilla always gives us!! !